Within Teamwork Desk, you can create custom fields which allow you to display custom information on your tickets and contact forms. Requesting specific custom information such as an account ID or product serial number from clients at their first point of contact helps to achieve a quicker resolution to their issue. Custom fields can be added to the access contact form, submit a request forms or the customer portal. Note: Custom Fields is only available on the Pro and Enterprise plan. You can access custom fields by clicking on the your profile icon to the top right of the navigation bar and selecting Settings. In the settings area, go to the Company tab and select Ticket Fields from the left pane. To the top right of the screen there is an option to add a new custom field. Once you select a custom field type, the custom fields form will be shown. At the top of the form, you can change between the different field types. Note: By choosing to mark the field as required, agents will be required to fill in the field before the ticket can be solved or closed. Can view - When enabled, customers will be able to see any custom fields that are associated with their tickets in the customer portal. Label - This is the label that will be shown to customers when creating or viewing a ticket. The label will not be translated. 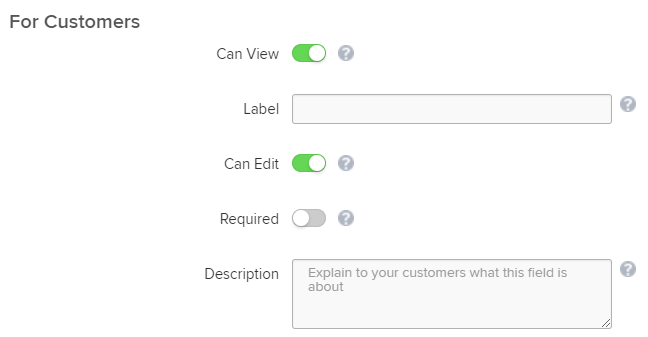 Can Edit - When enabled the custom field may display on contact forms and an edit option will be offered for the field when viewing associated tickets in the customer portal. Required - When you enable this the customer must complete this field before marking the ticket as solved or closed. 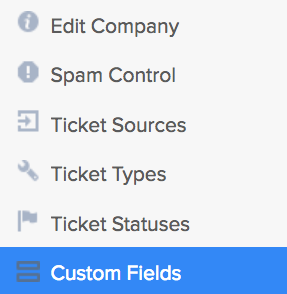 You can choose what inboxes you would like to apply the new custom field to. Tick the boxes next to each inbox you would like or use the search function to find a particular inbox. Click Save Field at the bottom to add the new custom field. Note: Custom fields can be included in the task description when creating a Projects task from a ticket.